Imagine a cluster of Caribbean Islands with white sand beaches, warm crystal-clear water, balmy temperatures, and palm trees swaying in the breeze. Now, crank up the “breeze” to a steady 20 knots and hoist the sails. Voila — you’re sailing in the British Virgin Islands! These islands, about 60 miles east of Puerto Rico and 1000 miles southeast of Miami, are considered by many to be the best cruising grounds in the world. 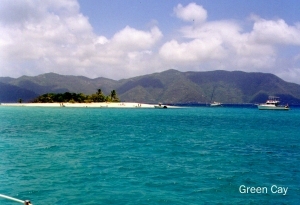 Ninety per cent of visitors to the BVI’s come to sail or participate in other water sports. Although the BVI’s are especially popular during the winter months as an escape from the chill of northern latitudes, there are some benefits to sailing the Virgins during the summer. 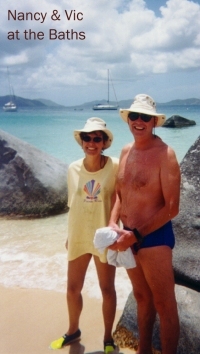 My partner Sandy and I spent a glorious two-week sailing holiday in the BVI’s. We were there in July and are convinced that summer is the time to visit these islands. Renting a boat during summer is considerably less expensive than during winter. From December to April, considered “high season,” you’ll pay almost twice as much for the same boat as from July to September. 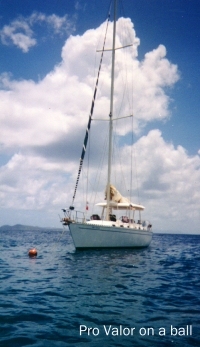 For example, the boat we chartered, a 45-foot Morgan, rents for $300 (U.S.) per day in winter and $200 per day in summer with a couple of free days thrown in if you charter for at least 12 days. We saved $1800 on our 14-day charter. Hotels and car-rental companies also charge 20 to 40% less during summer as compared to winter. Even the required cruising permit of $2.00 (per person, per day) in winter is only 75 cents in summer. The large charter companies generally have 90% of their boats booked during winter, but only 60% during summer. Most of the popular anchorages have 30 to 40 mooring buoys (called “balls”) as an alternative to dropping anchor. Even when we were there, we had to be at our planned anchorage by 1400 in order to find a vacant ball. In winter, with many more boats, you’d have to get to your ball before noon. Of course, you don’t have to be on a ball, but for overnight use they are well worth the $15 per night fee to ensure a sound sleep for the captain! Another source of crowds are cruise ships that stop in the islands on a regular basis during winter, but are nowhere to be seen during summer. Passengers from these ships visit the local shops and restaurants, so service is not as prompt as during summer. Many sailors visit the Virgins during winter to take advantage of the so-called “Christmas Winds” which blow steadily at about 25 kts. Unfortunately, novice sailors not used to such strong winds often end up motoring. During summer months, beginning around June, the winds die down to a more manageable 15 kts. Wave height is reduced accordingly to a foot or two rather than the three or four foot seas common in winter. These higher seas create swells or surges, which make some day anchorages uncomfortable or even untenable during winter. What about hurricanes? Don’t they typically occur in the summer? Yes they do, from June through November, but they generally pass north of the islands and are tracked very carefully by the weather service. All boaters are provided with at least two days’ notice to return to port. Over the years, very few hurricanes have actually hit the BVI’s. During our two weeks, a “tropical depression” in the Atlantic was tracked on computer by our charter company who provided us regular updates by phone. It never developed into a storm and eventually passed north of the islands. I was concerned that the islands might be too hot during summer. But in fact, the temperature averages 90º F, only about 5 degrees warmer than during winter. And the constant trade winds provide nature’s own “air conditioning” on even the warmest days. 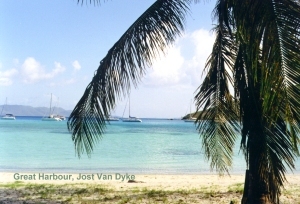 So, there you have it: several good reasons to consider a summer sail in the BVI’s. It’s less expensive, less crowded, and the weather is generally better. Two charter-company managers confirmed these advantages and several others I hadn’t thought of: showers are available at marinas without waiting, stores have a better supply of groceries and gift items, marina’s provide quicker access to water and fuel, and you have an extra hour of daylight for sailing each day. And of course, if you have children, you have another reason to go in the summer — school’s out. Traveling from Canada to the BVI’s usually involves several flights. We flew Edmonton – Minneapolis – Miami – San Juan – Beef Island. From there it’s a short taxi ride to Tortola, the main island where most charters originate. You can do this in one very long day; however, if you do, I’d suggest you wait a day or two before picking up your boat. Otherwise, you’ll be trying to catch up on your sleep for the next week. The BVI’s is composed of two main islands, Tortola and Virgin Gorda, about a dozen smaller islands, and another dozen or so cays (pronounced “keys,” Spanish for small islands). These islands break up the Atlantic swells, providing sheltered cruising in an area approximately 20 x 30 miles. Navigation is by eye since you’re always in sight of several islands and never more than an hour from a protected harbour. Tides and currents are negligible. Hazards such as reefs are easy to see and marked in red on a planning chart. A Cruising Guide provides navigation and anchoring information for most harbours and a publication called Virgin Anchorages provides color aerial photographs of the more popular harbours. One navigational chart covers the whole area. Our companions during the first week were my sister and brother-in-law, Mo and Joey. 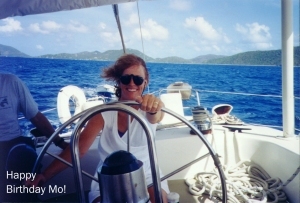 Mo was celebrating her 50th and neither had ever sailed before, so this was a special treat for them. By the end of the week, they were ready to buy the boat and move to the islands. During the second week, our friends Nancy and Vic joined us. Vic and I had sailed together off Vancouver Island a few years earlier with a few other guys. What I remember most about that trip was the cold winds and our diet of Oreo’s and Coor’s, which we thought nicely covered the four major food groups! This trip was going to be different — warm winds and meals ashore for the crew! 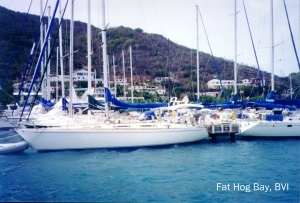 We chartered our boat through Pro Valor Charters located at Fat Hog’s Bay in Tortola. The morning after our arrival, we received an orientation to the boat and a briefing of the cruising area. We pre-ordered our provisioning to arrive at noon, and by 1400 were underway. At our first anchorage, Marina Cay, Joey fired up the blender and served his specialty drink — pina coladas. We ate our evening meal in the cockpit while marveling at the natural beauty surrounding us. A sea turtle surfaced a few meters away while a pelican perched on our dinghy motor. In the following two weeks, we only scratched the surface of this fabled cruising ground, but here are some “must see” places. A popular day anchorage, the Baths on Virgin Gorda consist of a half mile of beach strewn with large granite boulders forming hidden pools and grottoes. A specially-built trail with ladders and ropes takes you over and around the boulders. 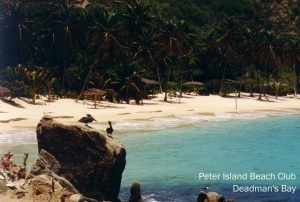 At the south end of the trail is Devil’s Bay, one of the prettiest coves you’ll ever run across (the sand is hot!). A further 5-minute walk to the backside of the island will lead you to ocean waves crashing against boulders, another unforgettable scene. Take a few bucks with you and climb a trail to visit the Mad Dog Saloon. The views are spectacular and the pina coladas almost as good as Joey’s! Just off Salt Island lies a British freighter, the H.M.S. Rhone, which sunk in a hurricane 130 years ago. The rudderpost is only 15 feet beneath the surface. A number of day-mooring balls allow you to snorkel directly from your boat. Dive companies on the various islands run regular trips to this location so it’s best to go early in the day. Since there are no overnight anchorages on Salt Island, we sailed over to adjacent Cooper Island for the evening. 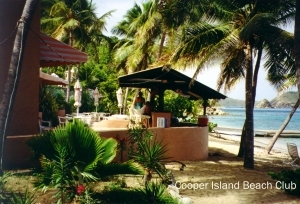 The Cooper Island Beach Club appears to be one of the more popular attractions, serving good food and exotic drinks. Nestled in the palms along a stretch of white sand is their beach bar, where we sat and sipped their patented “bushwhacker” while watching the sun set across Sir Francis Drake Channel. Sandy voted this her favorite spot! The next morning, we dinghied to Cistern Rock at the south end of the bay for some snorkeling. It was here that we saw our first barracuda, a nurse shark, and a spotted eagle ray although none of them appeared the least bit interested in us. 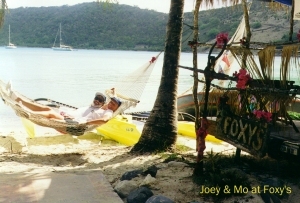 One of the more popular attractions on this island is Foxy’s, a “must visit” for cruising boaters. Anchor in Great Harbour and take your dinghy to the dock. This village of picturesque wooden houses on a sandy beach is a page from a by-gone era and is well worth a gander. A short walk along the beach will bring you to a few string hammocks under the palm trees. Listen carefully; if you hear a guitar strumming and occasional laughter, you’re in luck! Foxy is singing calypso ballads in his bar and grill. When we were there, we counted 15 boats at anchor. On New Year’s Eve, that number increases to 350. I’m just trying to visualize 350 dinghies at the dock at midnight! A short sail to the east end of the island is Little Harbour. Try the fresh lobster and friendly service at Harris’s Place and ask for “Bingo,” a 6-week old puppy that Sandy wanted to adopt. Mary, our waitress, said she would serve free drinks to anyone who orders lobster and asks for Bingo. That dog could become more famous than Foxy! Try the excellent snorkeling on the east end of the island at Green Cay — definitely one of the smallest and prettiest pieces of real estate in the BVI’s. You can walk around the island on beautiful white sand in just a few minutes. A mile south is Sandy Cay, another worthwhile day stop. Follow the path encircling the island for great views and a close up look at local plant life, from lush tropical foliage to cactus and acacia scrub, much like you would find in a desert. The U.S. Virgin Islands to the west overlap slightly with the British Virgin Islands. You can visit these islands without notifying Customs if you stay less than 24 hours. At Waterlemon Cay on St. John there are five free mooring balls and we managed to get one. This turned out to be our favorite anchorage — very peaceful, a deserted beach surrounding the bay. The snorkeling was outstanding! We swam around the Cay three times seeing starfish, large brain and elk-horn coral, sea fans and many varieties of tropical fish with names like parrot, sergeant major, spade, and angel. 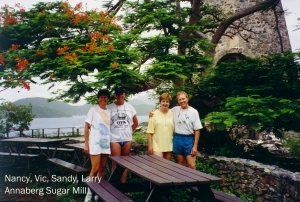 We also got our “cultural fix” by visiting the restored ruins of the Annaberg Sugar Mill for a self-guided tour. The mill was used to make rum, called “kill devil,” over a hundred years ago. Fortunately two thirds of St. John is a national park which will remain undeveloped as it is today. Robert Louis Stevenson reportedly had this island in mind when he wrote Treasure Island. Rumor has it that lots of buried pirate treasure may still remain. Unfortunately, we forgot our shovels! 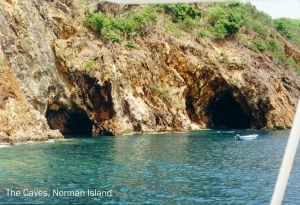 A popular and well-sheltered anchorage on Norman Island is the Bight. One reason for its popularity is just around the corner of the bay — the caves. You can snorkel right into one of several large caves at water level with thousands of tiny fish darting to and fro. When you get inside, look up — the florescent greens and pinks on the ceiling are fantastic! Vic wished he had an underwater flashlight to explore deeper into the caves where there is no light from the entrance. I’m glad he didn’t! The Willie T, moored in the Bight, is a replica of a 93-foot schooner christened as a floating restaurant in 1966. A floating dock alongside the ship often has dinghies three deep. Reservations are recommended. If you like barbecue ribs, these are definitely the best on the island! Lots of sailing yarns are shared at the tables and bar. On our last day, we anchored in pristine Deadman’s Bay for lunch. The Peter Island Beach Club had already closed for the season so we had the whole beach to ourselves, except for a couple of pelicans! While frolicking in the gentle surf, each of us tried in our own way to capture a little bit of paradise to take back with us. Sandy did the best job — she brought home the recipe for bushwhackers to help ease us back to reality! A contemplative 2-hour sail and we were back at the marina. Will we go back? You bet! In the summer? Of course — we’ll be skiing in the winter!